After his wife and two young sons die in a air plane crash, David Zimmer descends into a crippling grief. Suicidal and using alcohol as a way to numb his pain, one night he catches a silent movie and it makes him laugh, something he thought he was incapable of doing. With his interest piqued, Zimmer, who is also a teacher and a professor, researches the star of the film Hector Mann. He discovers that in 1929, Mann disappeared and was never heard from again. To add to the mystery, Mann only made less than a dozen movies, all of which also disappeared and then years later were slowly given one by one to various film institutes for posterity. Zimmer then goes on to write a biography about the actor and his work. Forward to 18 months after publication and Zimmer receives a letter advising him that Mann is still alive and wishes to meet him. The mystery of Herman Mann is an interesting one and kept me wanting to read more to find out what happened to our silent film star. And Auster did not fail to meet expectations, keeping the twists and turns unpredictable. In Zimmer, he created a character who from the start elicits sympathy and as a result places the reader in a empathetic role which extends beyond the tragedy of his loss. We continue on beyond his grief into firstly the intrigue of the vanishing Mann and then the need to know what happened. There are a few moments where the need to suspend your disbelief is pushed to their limits. These instances are where I felt you could see the strings so to speak, parts that didn’t feel like a natural occurrence but were there just to move the story along. However, there is a question in here that is more than what happened to Mann. The theme of the book is around art – Why do you create? Who do you create for? When we learn of what did eventuate with Mann, we are told that he is punishing himself, that he has to make movies but he stops his creations being viewed by anyone to prevent them becoming more real. Can an idea become more tangible, take on meaning only through others experiencing it? Is the appreciation of an audience the ultimate goal of any artist? It is an intriguing thought and one that Auster didn’t really approach in a subtle manner; the forced nature I wrote of above was really evident for me in the second half of the novel where this theme of art and its audience is raised. I’m appreciative because I’m not fully up with the play thematically with a lot of the novels I read, especially ones from the 1001 list, but this one was clearly obvious. I’m not saying heavy handed, but… well, yes I am actually. Heavy handed. I enjoyed the actual story in this book and in putting in more thought into it for this review, the theme was an interesting one to mull over . 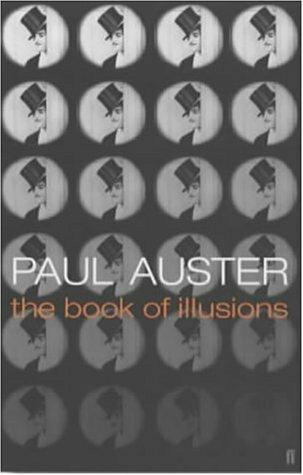 I particularly relished the way Auster was able to render a movie from a moving picture into word form; he is obviously a fan of this art form and the technical aspects of it. And yet for all this, if I didn’t have to write this review I probably wouldn’t remember what it was about a few months down the track. This is probably more revealing of my ageing brain than anything else, but for want of a better clichè, I am going to have to damn it with faint praise. It was ok but not great and certainly not memorable. So a miserly 2.5 out of 5 from me.